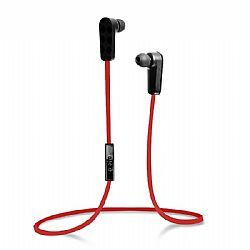 Jarv Nmotion Stereo Bluetooth Earbuds are the perfect choice for people on the go! No wires. No cables. The NMotion wireless Earbuds use Bluetooth 4.0 A2DP technology to connect to your Tablet, Smartphone, Computer or MP3 and are perfect for listening to music, watching movies, playing video games ..all the while being ready to accept incoming calls. Built in Li-ion battery works for up to 5 hours of listening playtime or 100 hours of standby time. With the NMotion Bluetooth Earbuds you are always ready to go. Noise Isolating Earbuds with high quality drivers provide deep bass and clear treble. The inline microphone reduces background noise keeping your calls sound quality clear and crisp. The Multi-function control unit has built in Volume, Play, Pause and Answer functionality. Three sizes of ear bud tips are included (small, medium and large) as well as a set of sport ear hooks for added support and a handy carry pouch. Charging through a standard micro USB cable (included). One Year Jarv warranty, visit manufacturer s web site for details.